"The Ponzi Book is one-stop shopping for the facts needed to understand the complex fall-out from a collapsed Ponzi scheme as well as the legal strategies that exist and are required to unravel it." A Ponzi perpetrator spends years building an intricate web of financial deceit, falsifying records, and embezzling and concealing assets. When the Ponzi scheme is finally exposed, the long and difficult process of reconstruction, discovery and recovery begins. . .
"The first sentence of The Ponzi Book states, 'Unraveling a Ponzi scheme is a messy and complicated affair' and the book goes on for about 800 pages explaining why. This is a phenomenal resource for navigating the legal minefields in unwinding Ponzi schemes with detailed chapters on issues we have litigated over the years. "It will be an excellent resource for all professionals including receivers, trustees, attorneys and accountants that are involved in these cases. Experienced practitioners will enjoy finding their old cases included in the over 3,500 footnotes. "As a second generation receiver, it was exciting for me to find my father's cases as well as mine referenced. I anticipate that this book will stay open on my credenza and be referenced often for years." The Ponzi Book is for . 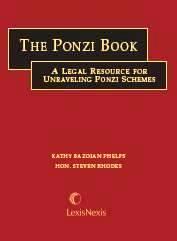 . .
Or anyone interested in the issues that arise in legal proceedings to unravel Ponzi schemes. "Madoff is just the most publicized scam. There are hundreds of others going on all the time. There is a virtual 'Ponzi-Palooza' out there, with new investor money being used to pay previous investors, and consumers are being victimized all the time."